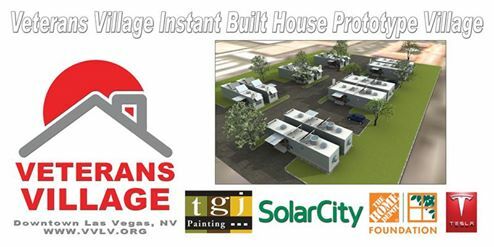 LAS VEGAS - Nov. 9, 2015 - PRLog -- WHAT: Veterans Village and SolarCity announced their collaboration on a prototype to bring solar resources to the Veterans Village Instant Built House constructed from standardized, recycled ISO shipping containers. The recycled housing units can be rapidly transported anywhere in the country via railroad "piggy-back" trains, semi, or jumbo air cargo transports for immediate occupancy for affordable housing that provides stability and support for our homeless, displaced and disadvantaged United States Veterans to successfully transition back into civilian life. “Veterans Village is proud to partner with Solar City on this breakthrough in technology incorporating a Repurposed ocean container, state of the art solar technology and donated materials from the Home Depot Foundation to build this affordable house we call Instant Built House”, according to Arnold Stalk, PhD, Founder of Veterans Village Las Vegas. WHEN: November 11, 2015, 5 p.m. – 8 p.m.
SolarCity® provides clean energy. The company has disrupted the century-old energy industry by providing renewable electricity directly to homeowners, businesses and government organizations for less than they spend on utility bills. SolarCity gives customers control of their energy costs to protect them from rising rates. The company makes solar energy easy by taking care of everything from design and permitting to monitoring and maintenance. Visit the company online at www.solarcity.com and follow the company on Facebook (http://www.facebook.com/solarcity) & Twitter (http://www.twitter.com/solarcity).